The famed warlord Toyotomi Hideyoshi was childless until late in life. To secure succession, he adopted his nephew to whom he gave the name Hidetsugu. While still a soldier in Hideyoshi’s army, Hidetsugu showed great promise of leadership, but became increasingly cruel and offensive. The opportunity to dispose of Hidetsugu came when Hideyoshi finally had a biological son. Hidetsugu was confined in a temple on Mount Kōya and ordered to commit suicide. 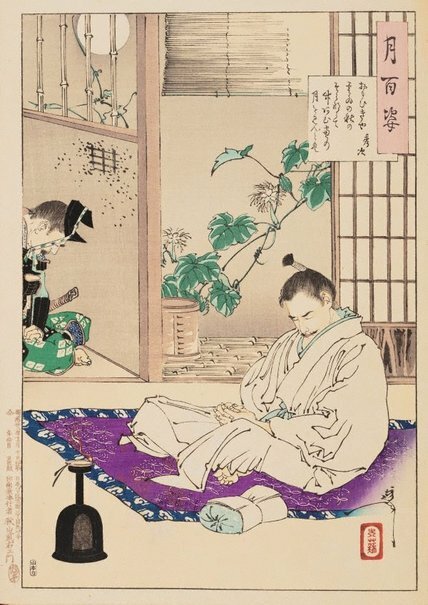 Accompanied by a loyal retainer in his last minutes, Hidetsugu is shown in deep thought, preparing for the ritual act and composing the death poem.